We take the safety of the travelling public very seriously and so do our maintenance contractors. Have you ever wondered what exactly we expect from them and how they meet our expectations? We spoke with Joe Wrobel, president of JPW Road and Bridge Ltd, to get the scoop on the many ways they work to keep you moving safely through the Sicamous and Salmon Arm area. TranBC: Could you tell us – what does a day in the life of your team look like? JPW Road and Bridge: Our team starts their day (or night) by reviewing weather forecasts and the work performed during the previous shift. Crews are dispatched to respond to weather and any work remaining from the previous shift. If a weather event occurs, the radar for the area is constantly reviewed to track the storm and maximize the allocation of resources. Crews are in constant radio communication and team up when plowing the main highways. Observed and anticipated surface temperatures are considered and monitored when determining which material (sand or salt) to apply. Work is performed in priority with the main highways first, then main collector roads, school bus routes and then the subdivision roads. Consideration is given to road grades as well. 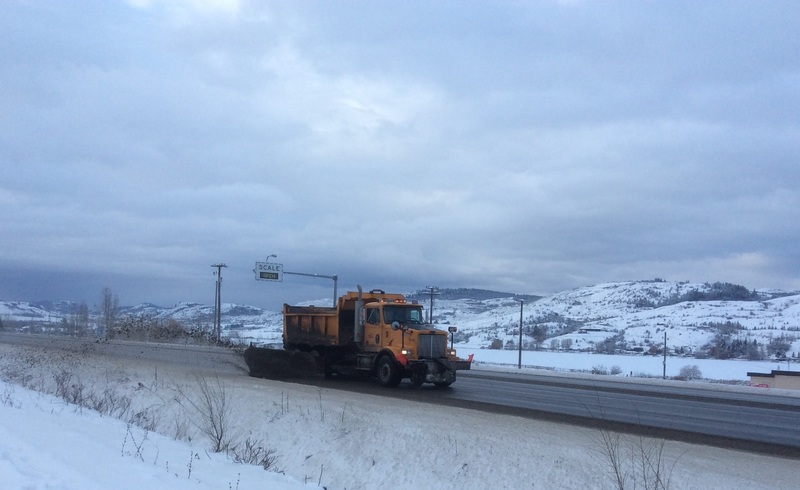 TranBC: The ministry sets out winter maintenance specifications that guide the work that you do. Could you explain a little bit about how your team work around the clock to meet those specifications? JPW Road and Bridge: Our service area is divided into eight areas with crews and resources stationed in each area to respond to local conditions. Over the winter we operate with both day and night shifts seven days per week. We closely monitor weather and forecasts and storm alerts are texted to all supervisors and managers. Our goal is to keep all required equipment rolling 24/7 throughout an event or series of events. When a storm event is in the forecast, we review our resources and dispatch operators and equipment to priority areas. During weather events crews will stay on shift until relieved by the next shift. Additional operators and hired equipment are called in to supplement the on duty staff as needed. TranBC: How does your team communicate road condition information to the travelling public (DriveBC) and what does that communication mean? JPW Road and Bridge: We poll our crews over the radio system at least three times a day and compile road condition reports for input onto Drive BC. Road condition reports are provided for long segments of the highways. These are not the average conditions but are generally the poorest conditions observed over the segments. This information is intended to warn travellers of the conditions that they could expect in their travels over these highway segments. If there is a highway closure for any reason, it is communicated as soon as our crews are alerted, with specifics provided to Drive BC including: the number of lanes closed, expected opening time, confidence and any available detours. TranBC: Do you have any new approaches to road maintenance you would like to share? 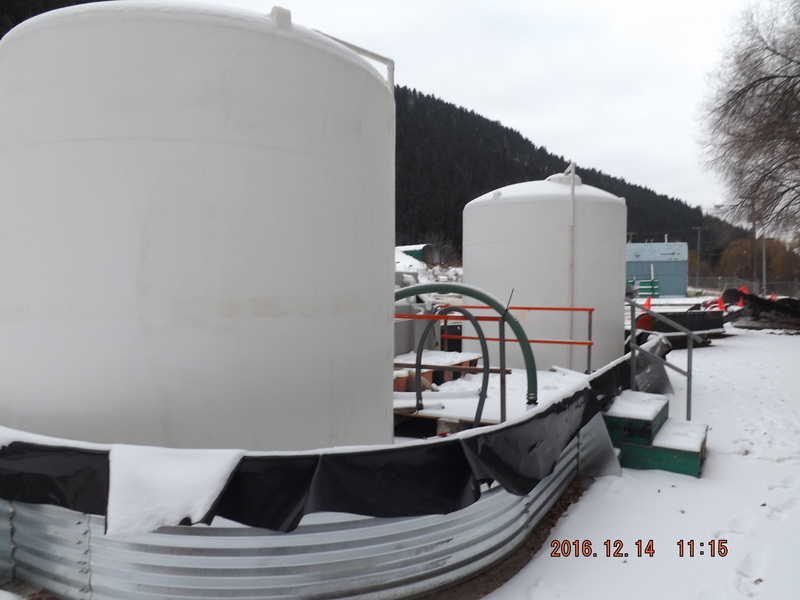 JPW Road and Bridge: We’ve expanded our brine use of liquid chemical application in across our service area this winter with brine making equipment, storage and an application unit based out of Chase. This compliments the brine equipment and storage that we have been using out of our Armstrong yard. We have also added more wing plows and extendable under body plows for this winter which has increased our plowing capacity. JPW Road and Bridge has a new brine making facility in Chase BC. TranBC: What’s the number one thing you want the travelling public to know when they are travelling BC Highways? Allow highway maintenance operators and equipment the time and room they need to do their job. 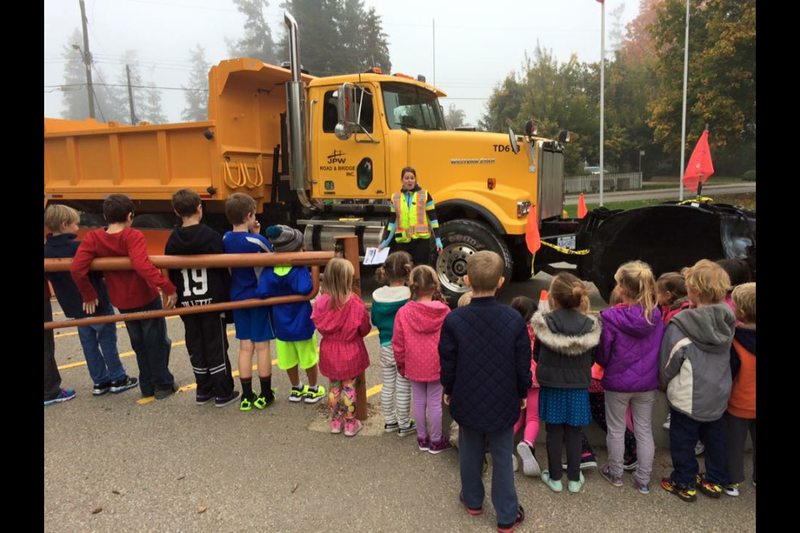 One of our employees “Shows off the Plow” during a snow plow safety talk. We provide the talk to more than 800 students a year! JPW brings in additional mechanical staff to help during storms and have additional trucks available in reserve should they be needed. They also notify key stakeholders (i.e. school district bus operations) with storm alerts. Abrasive (sand) piles are strategically located to shorten return times and salt supply is closely monitored. JPW starts the winter season with full sheds and restocks as necessary. Staff are oriented and trained before winter; however most staff already have many years of experience in the area and doing this work. Bridge crews and hired equipment are dispatched to clear sidewalks, most of which are on bridges. Lastly, JPW equipment is serviced between events and readied for deployment. Wow! That’s a lot of great information. Thanks to JPW Road and Bridge for sharing with us. Do you have any questions about this or anything else the BC Ministry of Transportation and Infrastructure does? Let us know in the comments below. We live on Coell -Jones Rd, Mara and would like to get a grader down here to wing back the huge amount of snow! We realize that you have been very busy this year….. I live on Larch hills /Rosemond Lake Forest Service Road which is near Salmon Arm. My question to you is why have I only had 1 snow removal by JPW since the 23 of Dec. A total of 42 days without snow removal. JPW has been doing snow removal on this road for the past three winters and now nothing? Help, this is our only access. Hello Robert – we shared your comment with the local area manager who informed us that Rosemund Lake Forest Service Road is not a Ministry of Transportation maintained road. We understand that Ministry or Forests Land Natural Resource Operations has an arrangement with our maintenance contractor JPW but the details of that arrangement are between the Ministry of Forests Lands and Natural Resource Operations and JPW. The deal between them is completely outside of our maintenance contract because it is not a public highway. Sorry we couldn’t be of more assistance on this. I was travelling from Sorrento on Blind Bay road. As I came down the hill just before Cedar drive I came upon a JPW sanding truck that had spun out attempting to cut the corner from Blind Bay road and up onto Cedar drive. He had slid backwards into the ditch on Blind Bay road and was partially blocking the road. I turned up Cedar to try avoid him and stopped so my wife would hopefully see me as she was traveling behind me. As soon as I stopped I began to slide down Cedar onto Blind Bay Road and sideways into the snow blade of the JPW truck. Why had the driver not installed the chains that were hanging in front of the back tires BEFORE attempting to drive up Cedar? What was he going to do once he got onto Cedar. Has he never travelled through the steep hills in this area before. Why will drivers not use there chains? Now I have damaged doors, wheels, and fenders. Not impressed. Thanks for letting us know Ala. We have sent this message to the area manager for review. We have not had our road Sunnydale Drive in Shuswap Lake Estates done as of toda, Janaury 29…it is 4 pm in the afternoon and we can barely get down our road today and it has been day 3 since the snow started. Who do we hav to call to have someone plow our road?? k sideways on cedar Ave No not in the ditch on the Avenue right in the middle of the road approx 18 inches of untouched snow thank you so much for your great work done. We sent your comment to the local area manager who confirmed that this road has been plowed and there are no vehicles stuck at this time. The local manager showed up? Next time stop in for coffee and we’ll go over some pictures and dates last cedar was plowed January 15 and then sanded. I’m sorry maybe to be clear about my vicinity Cedar in Anglemont. after we paid a neighbor to plow the avenue yes it was better. Do I send the receipt to JPW for reimbursement? JPW Road and Bridge Inc. I have never seen such poor winter road care by JPW. This morning (Jan 13-2018), I wsa coming down Marine Dr in Blind Bay BC. The pick up truck snow plow ( ST131) had just plowed but did not put down any dirt/gravel until right at the stop sign at Blind Bay Road. it is tough getting up and down these streets in Blind Bay with the clearing that these trucks are doing. Also the smaller roads, like Marine Place, Leisure road, and Chalet are an absolute mess. This needs to be addressed immediately. Thanks for sharing your concerns, Mrs. D. I reported to the local area manager. He is investigating and will discuss with the maintenance contractor. It would be really nice to know where this crew is. It seems to me that JPW is kind of like a sasquatch….You know they’re out there, you just never see them. The road in the Blind Bay area are absolutely terrible. You need another company doing diligence. Now the snow on the roads are frozen. There is hardly any dirt laid down. Skimikin road is an utter disaster. Perhaps you should actually come out and see the roads for yourself. It’s the talk of the village. Tell the boys to put their blades down. The roads are like wash boards. Hello Mrs. D – thanks for your comments and concerns. We sent your comment to the area manager who informed us that they are aware of these concerns, that staff are out monitoring contractor activity daily and will be bringing their inspections, audits and monitoring notes to perform a storm debrief with JPW later this month. I would like to extend a great big thank you to the JPW Grader that came up Marine Dr as well as Leisure Rd and also Chalet. it was an absolute pleasant surprise to see him coming up the road. I rolled down my window and gave him a huge thank you. Thank you again, most kindest regards, Mrs. D.
How on earth did this company get the contract when the job is never done…..
Hi there Dar and thanks for letting us know your comments and concerns. 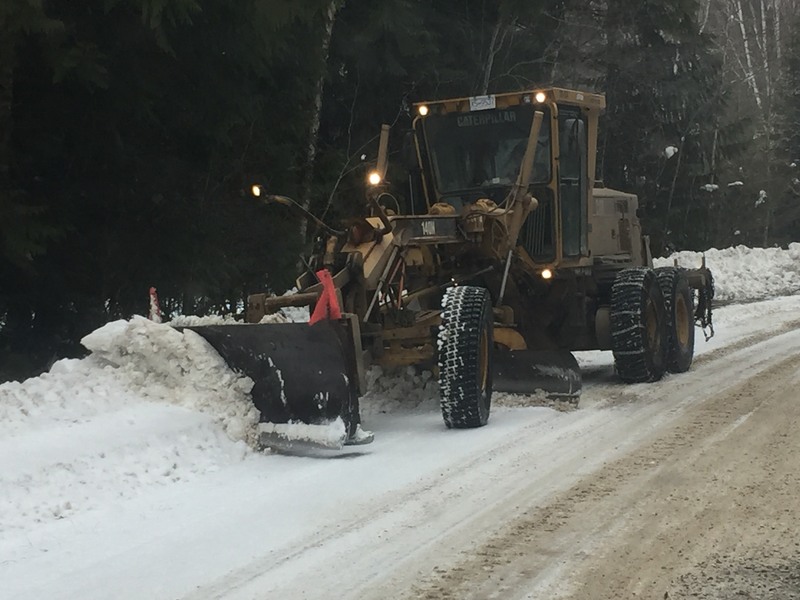 We have shared them with the local area manager for review and can confirm that our maintenance contractors are on patrol of roads in their service area around the clock in order to keep traffic moving during winter (and year round). we in the northshuswap Anglemont area live on a cedar avenue that was reinstated as a lower priority road, yet this being known to the contractor supervisor this avenue has not been touched this year at all. I guess we have been fortunate that an ambulance or fire truck did not need access. So for our safety we have contracted a separate business to do the cedar avenue in Anglemont. just looking for some reply on this statement. Hello again Doug. Good news! We sent your comment forward to the local area manager who informed us that Cedar Ave. is presently rated as a 7F which doesn’t require winter maintenance. MOTI is in the process of changing the winter rating to a “D” which will allow for winter maintenance. JPW (Maintenance Contractor) has been advised and will provide maintenance moving forward. the news is good but the application of the work done has been and remains untouched. every class D designate has been done out here except Cedar ave. I think if they want someone to do the job bring the equipment and I’ll do it myself. JUST SAYING. We sent this message along to the local area manager and he is following up with JPW about it. Thanks for letting us know.